Despite widespread concerns about fraud, foreign interference and ineffectiveness, there remains a clear appetite among many Afghans for a system of democratic representation. However, this must be centred firmly around their own priorities if it is to take lasting root. 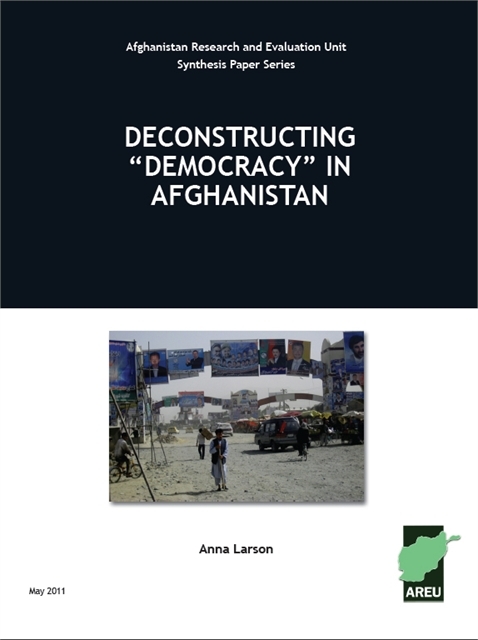 Building on two years of research in six contrasting provinces, this report explores Afghan perspectives on democracy and their possible implications for the future. The research brought together the opinions of men and women from diverse social backgrounds, living on both sides of the rural/urban divide and in areas with varying security levels. Across this array of different hopes, expectations and concerns this revealed, three key themes emerged. • The issue of Afghan ownership against foreign imposition was a hot topic for many respondents. While many people saw “democracy” as an unwelcome imposition of Western culture and values, there was generally strong support for the idea of selecting representatives via elections. Others also spoke of the need to fix Afghan democracy within an “Islamic framework,” though this was rarely defined. • Democracy and democratic participation were also viewed as a distant second priority to ensuring security and stability. Immediate concerns over the threat of violence that political engagement often entails were framed against a more general call for a “politics of consensus” and a deep suspicion of political parties. • There were also sharp contrasts in people’s perspectives on the nature of equality and representation, specifically regarding who should be represented, and how. However, there was an almost unanimous call for greater equality of access to decision-making, service provision and resources, and in this respect many saw Afghanistan’s current “democracy” as little more than a front for the powerful to accumulate wealth and extend their reach.